Direct trade is pretty much exactly what you would expect. For example, I am an online marketing specialist that has a family to feed. I have a client that needs an online marketing consultant who is in the business of delivering organic groceries. It’s a perfect fit! We are bartering in a direct trade. I provide approximately $400 worth of services per month to him and he delivers approximately $400 in groceries to me per month. We have a written contract and for the most part both of us provide goods/services to each other in exactly the same way we would if we were each conducting cash transactions. Of course it isn’t always that neat and clean. Sometimes one of us will get ahead of the other. To keep track of the numbers, I send out a monthly statement showing how much work I’ve done and how much groceries he’s delivered. That way everyone knows where we are at. We worked out ahead of time that if either of us gets too far ahead we need to make it up in cash. If you want to start making some direct trades, the process that’s worked for me is pretty strait forward. Create a list of products/services that you want and create a second list of products/services that you have available to trade away. Start calling on vendors that have the items from the first list and offer to make a deal. The worst thing that can happen is that they can say “no.” It can take a while to find someone who wants to play ball, but in my experience if you keep working at it and you are really trying to create a win-win situation, eventually you will make a deal. Another idea to find direct deals is to post your top items in the barter section on craigslist.org. Direct barter is good, however it can sometimes be difficult to find a direct barter for exactly what you want. In those cases a Barter Exchange can be very helpful. 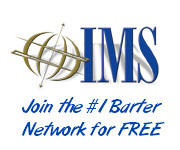 A Barter Exchange is a business that keeps track of barter transactions for you. You can provide products or services for anyone in the organization in exchange for barter credits. You can then use those credits to buy products or services from anyone in the group. Exchanges make their money by charging regular service fees (which are usually fairly low) and charging a cash commission on transactions (usually 10 to 12%, half coming from the buyer and half coming from the seller). It turns out that finding a good exchange to use is probably a lot harder than I realized when I first started. There are a lot of things behind the scenes that will effect your experience and honestly, it can be pretty difficult to smoke those issues out as a new trader. My advice is to do a little homework and ease your way into it. Make sure that the exchange that you are considering joining has many members (especially local ones) that you might want to trade with. Ask the the exchange for some referances. Specifically you want to talk to some people that have been trading through the exchange for a long time. I hate to break it to you but barter is not a tax dodge. According to the IRS, barter income must be reported just like cash income and is taxed exactly the same way too. 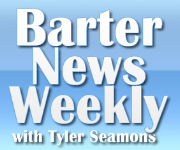 Barter exchanges will send out a 1099 at the end of the year so the IRS is aware of your barter income.